We flew in from Shanghai on an early morning flight (7:10am), and arrived in XianYang Airport at around 10:30am. Flights in China are always a little unpredictable – there’s almost always a delay unless you’re one of the first flights out. So always set aside extra time for the first day. 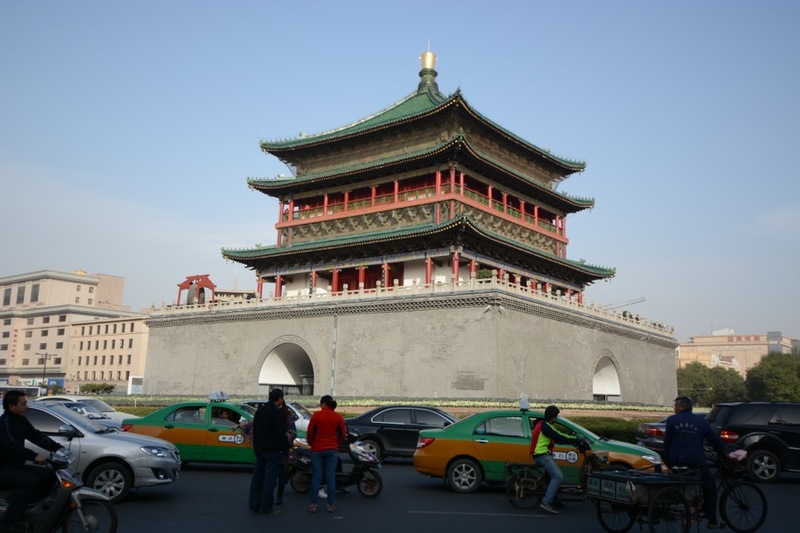 1) Check in: We stayed in a hotel as it was just the two of us but a number of our friends have tried the hostels in XiAn and most were rather decent, clean, and very near the Muslim Quarter. They also have private double rooms, but the cost might end up being around the same price as a hotel. 2) Lunch at a local Biang Biang Mian eatery. Look out for the famous complicated character that’s not available in print as of yet. Where: They’re honestly available almost everywhere especially within the Muslim Quarter. The one near our hotel was at 东一路，近尚勤路 ： Dong Yi Lu, near Shang Qin Lu). It was comparatively more clean with an open kitchen. Also so yummy, we actually went back twice. 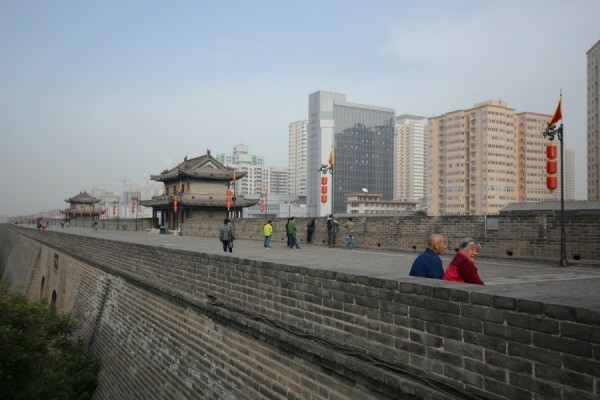 3) Visit the City Wall: The South Wall probably has the most scenic view, so start there because, in case you get tired of walking or cycling on the walls, you can feel better knowing you’d seen the prettiest side. You are able to enter and leave at all four gates – The North, South, East, and West Gates. Cycling is recommended if you were thinking of completing a full round around the city walls, as the walls are about 25km long in total. What we did, however, was just a walk from the East Gate to the South Gate. 4) Bell Tower: We had a walk past the Bell Tower. Some may choose to head up, but we weren’t too eager to fight throngs of people just to head up a few stories. We felt the view of Bell Tower from across the street would be far more interesting than the view of the streets from the Bell Tower. We did stop by for a cup of coffee in the hidden Pacific Coffee on the second floor of the building behind the big plaza, before continuing on to the Muslim Quarter. 5) The Great Mosque: It’s right in the middle of the Muslim Quarter. It’s quite missable if you depended solely on the signs. The plain looking sign for the mosque was mostly hidden amongst the vibrant flashy lights of street stalls. 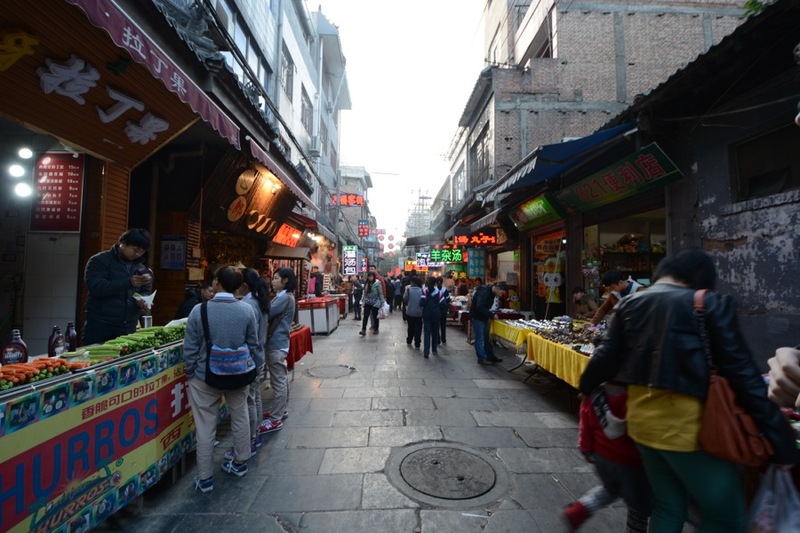 Head down North Guangji Street (北广济街) and turn into the narrow Huajue Alley（化觉巷). The entrance of this Mosque would be near the end of this alley. 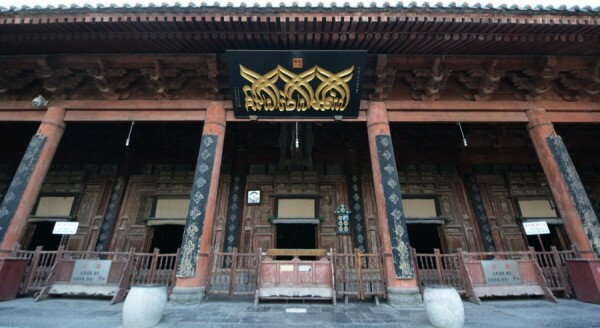 The design of the mosque is more of a temple, complete with a Chinese garden. 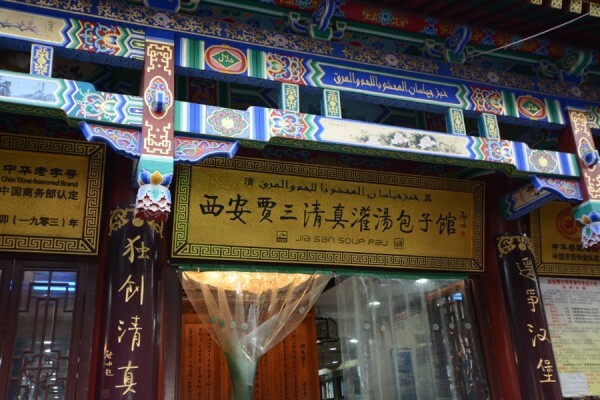 However, instead of Chinese characters, you see more Arabic scriptures from the Quran, and there was none of the burning of incense in a typical temple. I probably took more away from it, having links to the culture. It was especially interesting for me a mosque built in such a way, and to see the Arabic scriptures written in the style of Chinese Calligraphy. 6) Muslim Quarter: Continue taking in the vibrant atmosphere in the Muslim Quarter and have some 羊肉泡馍 (yángròu pàomó), which is a meal consisting of pieces of bread in hot mutton soup (available in beef form as well for those who dislike mutton) for dinner. In some places, they crack the bread pieces for you beforehand. However, if you were only served bread in a bowl, don’t panic – you only have to break the hardened bread into small portions (as small as you can), and the waiter will then pour the soup and meat into your bowl. If there’s space left in the tummy, try or takeaway the street snacks and candies there. 肉夹馍 (ròu jīa mó), a sort of sandwich with pulled meat, is quite a nice and popular light bite if you don’t have time for a full meal. There are also lots of things we ended up trying, like the fried banana coated in breadcrumbs, and sesame malt candy made fresh. Be adventurous, but be smart – you can easily tell which places are safer to eat at. 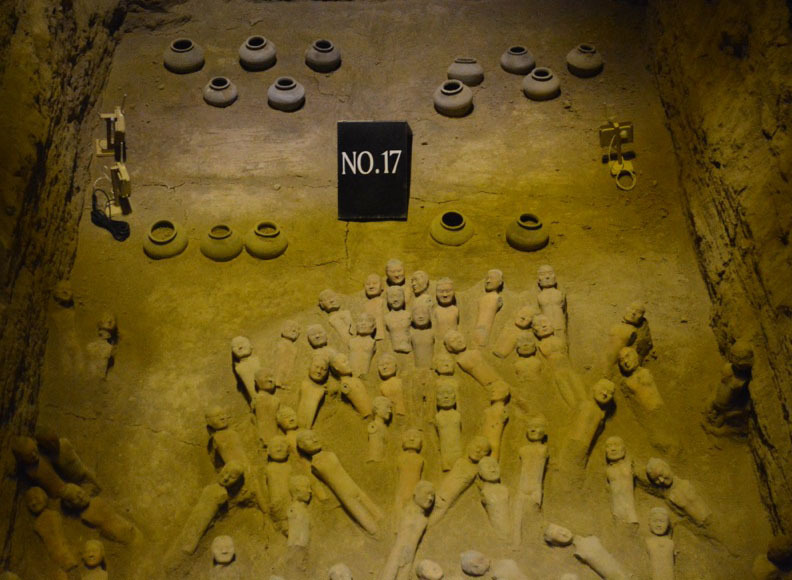 1) Terracotta Warriors & Qin Mausoleum: The Terracotta Warriors site itself is great, though Pit 1 was where all the stuff were. The other two mostly had empty pits. 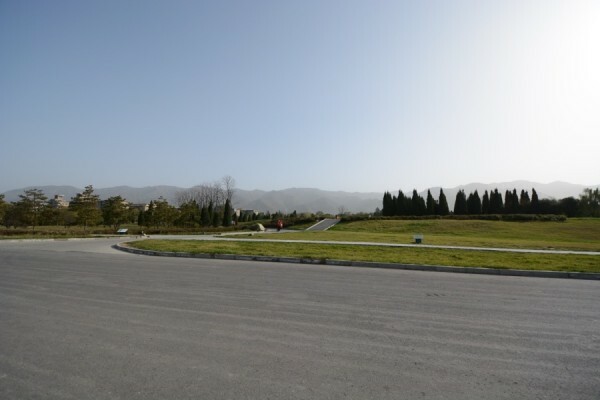 Qin Mausoleum on the other hand, was good to miss. When you purchase the ticket to head into the Terracotta Warriors site, the Qin Mausoleum is automatically included in the price. There’s a free bus that links the two places. You have to board the golden bus right outside the ticket office of Terracotta Warriors near the carpark. 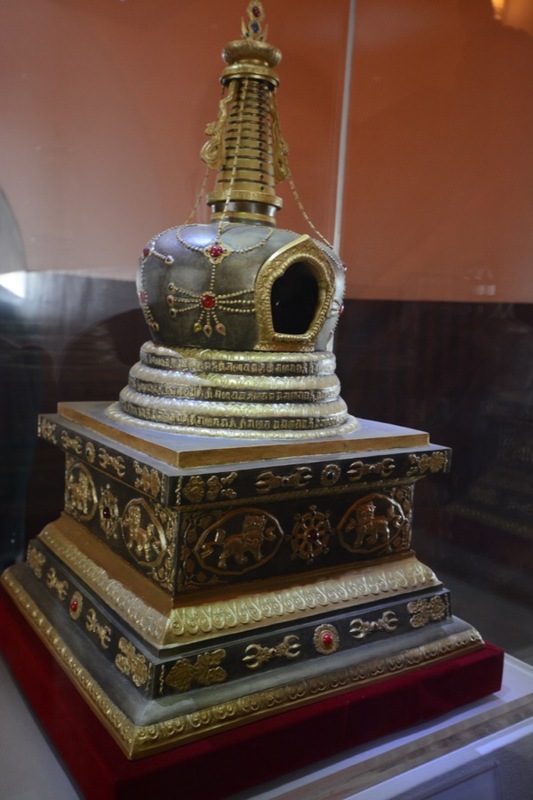 Qin Mausoleum is just a mount which is yet to be extracted due to the high levels of mercury believed to be underground. 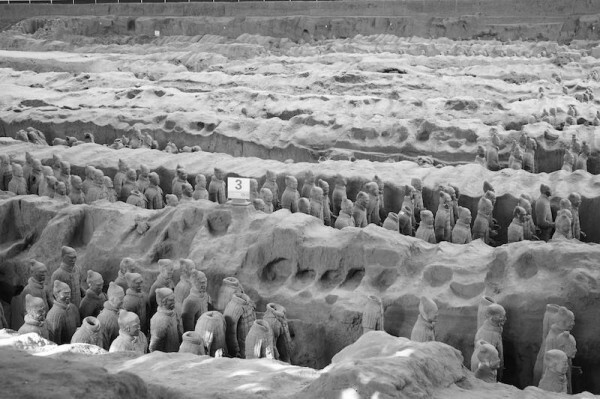 There are some museums, and they all contain impressively…empty pits (most have been moved to the Terracotta Warriors site). If you happen to already be there, like us, just sit on the electric cars and have a nice view (on a good air day) of the mountains in the distance, and then head back. If you’re going in a big group, it might be okay to book your private transportation in advance, which might cost over 300yuan per group, depending on the sort of services you hire. However, as it was just the two of us, we decided to go ‘local’, and we have to say we were very pleased with the bus connections in XiAn. It was really convenient and fuss free. There are several 游(#) buses (Tourist Buses) that connects central XiAn to various tourist spots further out. Bus 游#5 (306) or Bus Service 914 goes through the HuaQing Hot Springs, and ends at the Terracotta Warriors site. From reviews online and our own experience, we believe Bus 游#5 (306) is more reliable. No matter what they say (914 tend to claim to be an express bus and charges a bit more), we still saw both lines making some stops along the way, though very minimal. One-way Fee: 7 yuan for Bus 游#5 (306), other buses are operated by private operators and might charge 8-10yuan. Pay on board. Frequency: Every 15-20mins. Seeing we went on Saturday around 11am, we only waited about 15mins before boarding our bus. Maybe it’s luck, but the queues certainly moved quick. From Railway Station: First bus is at 7am, and last bus is at 6pm. From Terracotta Warriors Carpark: Last bus is at 7pm. 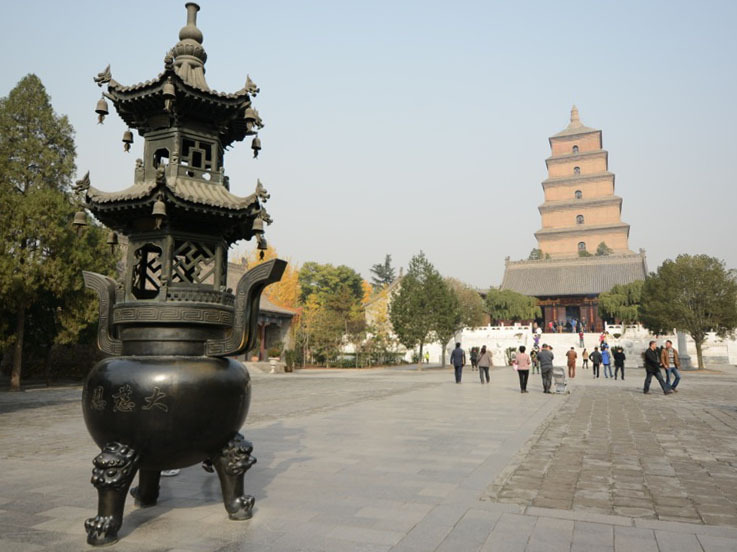 1) Da Ci’En Temple & Wild Goose Pagoda: Our initial plan was to do the Pagoda the evening before. However, we got carried away relaxing in the hotel after the Terracotta Warriors and had such a long happy dinner (Biang Biang Mian again!) that we decided to give the Lights Show a miss. Having said that, growing up with all the Journey to the West tv series in Singapore, I really wanted to visit the temple where Xuan Zang was Head Monk at, and the Pagoda that contains most of his translated texts from India (even though they were too complicated for me to read), and that big hat that’s replicated and featured in a lot of the Journey to the West shows. I almost, expected to see Sun Wukong, and the other two fictional disciples of Xuan Zang. So we got up for breakfast, and made our way to the Da Ci’En Temple. We entered from the South Plaza where we were hunted by the man behind the telephoto lenses. But everything was peaceful on temple grounds after. The Pagoda was worth the climb, and the temple itself was surprisingly peaceful and quiet, and we all know how rare that can be. We had a nice stroll around the garden and temple grounds before heading out to see the day time fountain show. 2) Han Yang Ling (Tomb of Emperor Jing Di): This was our last stop before the airport. As it was along the way to the airport, we decided to just get a taxi hire from the hotel. This was one of our favourite sites in XiAn. 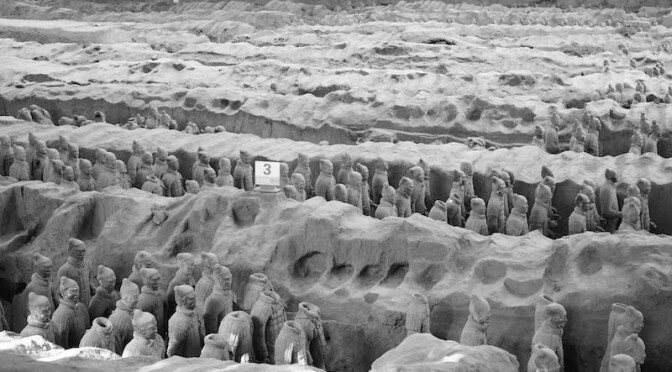 We actually liked it better than the Terracotta Warriors. The displays were interestingly arranged, and they were just a curious sight. Imagine hundreds of people, horses, and cattle of several sizes buried and excavated years later. They are drastically different from the Terracotta as well. They were smaller, not as dashing in heavy armor, but there’s just something about them that kept our interest. We had a bit more time before our flight so we even popped by to the burial sites of the Empress and the officials nearby, and took a stroll around the gingko and rose gardens before leaving. Phew, that’s about it. Hope I didn’t miss anything out. We’ll be sharing more photos we’d taken on this trip on a follow up post.